An Historical Time-line of the Greater Himalaya, Central Asia and the Fur Trade in Canada. Books on the Early History of Canada, First Nations, the Fur Trade, and the Canoe. Dramatis Personae of the History of the Greater Himalaya, Karakorum, Pamirs, Hindu-Kush, Tibet, High Tartary and Surrounding Territories, up to 1921. The intent is to compile a time-line that documents the chronology of significant events, with appropriate annotation, relative to the exploration of history of the regions in and periods in question. It is a simple cheat sheet, that helps me remember what happened when, and what the pertinent details were. Why Central Asia and the Canadian fur trade? The simple answer is that these happen to be topics whose history interests me, as is reflected in my library. In order to remain more-or-less within the realm of the manageable, the time line only goes to 1907, which is the date of the Anglo-Russian Convention, the treaty that essentially ended the forward policies in Central Asia which constituted the "Great Game.". Please think of this as an "open source" page. As with all of my pages, comments and suggestions are welcome - especially suggestions for additional people to include, mini-biographies for them, or additions, corrections, etc. to existing biographical or bibliographic notes. For detailed timelines of many of the events below, click here. For a detailed timeline of the history of Afghanistan from 1919 - 2001, click here. ca. 563 B.C Birth of Siddhartha Gautama, the "Buddha" In north India at Lumbini near the Himalayan foothills. 220 AD Han Dynasties in China Actually 3 Han Dynasties in this period. 138-125 BC Zhang Qian (Chang Ch'ien) in Bactria. Travels to Pamirs. First Chinese on record to have heard about the existence of Tien-chu, or Tianzhu (India). Reported "discovery" to Emperor Wu. 68 Cai Yin travels to India from China. Sent by Han emperor, Mingdi, to learn about Buddhism. returns after 3 years with images of Buddha, Buddhist scriptures and two Buddhist monks, She-mo-teng and Chu-fa-lan, to preach in China. 166 First Roman envoy sent to China Sent by Marcus Aurelius due to importance of trade on Silk Road. Arrived safely. 399-413 Faxian (Fa-hsien) travels from central China, over Taklamakan Desert to India. Chinese Buddhist pilgrim, in search of sacred manuscripts, who wrote of his travels. 476 Romulus Augustus deposed Last Roman Emperor in the West. Effective end of Roman Empire. 527-1453 Byzantine (Eastern Roman) Empire Begins with reign of Justinian, ends with fall of Constantinople to Ottoman Turks in 1453. 618-907 Tang Dynasty in China The height of the "Silk Road" was achieved during this dynasty. 629-645 Xuanzang (Hiuen Tsiang) travels to India 16 year round trip, including extensive travels in India to visit Buddhist shrines and collect religious manuscripts. 657 & 664 Wang Xuan-ce travels from China to Nepal & India Chinese diplomat. Made four trips. Took passes through Nepal, rather than Pamirs, reducing travel time to 9 months. 747 Gao Xianzhi (Kao Hsien-chih) leads Chinese army of 10,000 overland from Central China to north Pakistan/Kashmir Through Kyrgistan, Uzbekistan, across Pamirs and Hindu Kush to Afghanistan, Pakistan, and Kashmir in an attempt to stem the flow of Islam from West to East Turkestan. 960-1279 Sung Dynasty in China Divided into Northern and Southern Song. Split was forced by abandonment of north China in 1127 due to invaders. 1160-73 Rabbai Benjamin of Tudela Travels from Spain, through Syria, Bagdad, Persia and to frontiers of China. 1245-47 Giovanni Pianô Carpine travels overland to Karakorum Sent by Pope Innocent IV to court of Great Mogol. 1253-55 William of Rubruck travels overland to Karakorum Sent by Louis IX to court of Great Mogol. 1267 Kublai Khan makes Beijing his capital city. Names it Daidu meaning great capital. 1279-1368 Yuan Dynasty in China established by Kublai Khan. End of Sung Dynasty. Was Mongol dynasty. 1325-54 Ibn Battuta travels From Tangier, East Africa, Iraq, Persia, India, Maldives, Malaysia & China. 1327 Oderico of Pordenone in Tibet Franciscan friar. From Beijing through Tibet. Disputed whether he visited Lhasa. 1453 Fall of Constantinople to Ottoman Turks End of Byzantine Empire. Establishes Ottoman Empire, which ended in 1924. 1494 Treaty of Tordesillas Pope defined boundary line between Portugese and Spanish territories. 1498 Vasco da Gamma reaches Calicut, on south west coast of India. First European to reach India by sea. Returned to India in 1502. Goa was made capital of Portugese possessions in India in 1510. 1517 Portugese first reach China. Reach Canton under Fernao Peres. 1524 Giovanni da Verazzano first European discovery of New York city area. 1526 Beginning of the Mughal (a.k.a Mogul or Mongol) Dynasty in India Started with Babur's defeat of Ibrahim, the Sultan of Delhi at Panipat in the Punjab. 1607 Third Voyage of East India Company First voyage for which India was an object of the venture. 1609 Henry Hudson explores New York city area. Sailing on commission of Dutch East India Company. Proceeded north along Hudson River as far as Albany. 1610-11 Henry Hudson discovers Hudson's Bay Sailing on commission of British East India Company and Virginia Company. Maps eastern side of bay. Winters in James bay. Crew mutinies in 1611 and set him and supporters adrift. They then return to England. 1611-14 Dutch explore and map New York area Adriaen Block and Hendrick Christiansz survey and chart the territories discovered by Hudson in 1609. 1612-16 Thomas Coryat walks to Agra Visits court of Great Mogul. Walks from Aleppo, across Persia and Afghanistan. 1614 Dutch establish trading post up Hudson River Established Fort Nassau near present day Albany. Abandoned in 1617 and replaced by Fort Orange in 1624. 1624 Dutch establish 1st European colony in area discovered by Hudson/ Established Fort Orange (near current Albany NY) up Hudson River, as well as on what is now Governors Island. In 1625 the latter colony moved to southern tip of modern day Manhatten. 1625-35 Catholic Mission in Tsaparang, Tibet Established by Andrade & de Sousa on 2nd visit to Tsaparang. 1628-32 Catholic Mission in Shigatse, Tibet Established by Cacella & Cabral. 1631 Azevedo crosses Himalaya Reaches Leh by Mani Pass and returns to India by Baralacha and Rohtang Passes. 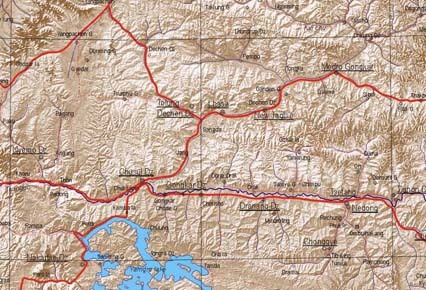 1661-62 Grueber & d'Orville Trip through Tibet Overland from Beijing to Agra via Tibet and Lhasa. First undisputed Europeans to reach Lhasa. (See Oderico of Pordenone, 1327). 1664 Dutch colonies in New York fall to English Regained in 1673 but ceded permanently to the English the next year in the Treaty of Westminister. 1668-69 Nonsuch winters in James Bay First English trade voyage to Hudson's Bay. Radisson and Groseilliers approached English about establishing fur trade in Hudson's Bay. 1668 Groseilliers set off from England on Nonsuch and Radisson on the Eaglet. Latter had to turn back but former spend winter at mouth of Rupert river trading. 1670 Royal Charter granted for Hudson's Bay Company Known as The Governor and Adventurers of England trading into Hudson's Bay. Incorporated May 2. Covered entire Hudson's Bay watershed, known as Rupert's Land. Rémey de Courcelle ascends St Lawrence River to Lake Ontario May be the first documented case of a European doing so. 1673 Establishment of Fort Frontenac At present day Kingston, Ontario, at foot of Lake Ontario. Established to curb advance of Iroquois, who were largely aligned with the English, on the north shore of Lake Ontario, as well as a depot for the fur trade. 1677-79 Establishment of shipping on Great Lakes In 1677 Rene Robert Cavalier Sieur de La Salle built 4 brigantines/barques at Fort Frontenac - the first sailing vessels on the Great Lakes. These were to carry goods between Fort Frontenac and the head of Lake Ontario. The first of these, the small 10-ton schooner, the Frontenac, which was wrecked - the first in the Great Lakes - at Hennepin Rock on the Niagara River. The Frontenac had been carrying materials for the construction of a larger ship, the Griffon, which was launched August 7, 1679, the first ship to be built above Niagara Falls. It became the second ship lost in the Great Lakes. 1690-91 Henry Kelsey's trip west from Hudson's Bay Traveled to Saskatechwan River and to praries on behalf of the HBC. 1713 Treaty of Utrecht End of War of the Spanish Succession. France cedes Noerh American lands to the HBC, including Rupert's Land, Acadia, and Newfoundland. 1716 Signing of the "farman". Laid foundation for British rights, leading to territorial occupation of India. 1717 Bekovich expedition to Khiva Disaster. 1729-30 Samuel Van de Putte through Lhasa Dutch. Overland from India to Beijing, via Lhasa (return via same route). Destroyed records, other than sketch map. 1735 D'Anville's Atlas of China published in final volume of Du Halde's, Description geographiqe, historiqe, politique et physique de l'empire de la Chine et de la Tartarie chioise. First European map of Tibet. Much of the Tibetan surveying done by Chinese trained by Europeans. 1739 Nadir Shah occupies and sacks Moghul capital, Dehli. Makes off with "Peacock Throne" and the Koh-I-nur diamond . Moghul empire in decline. circa 1740 Horse is first introduced into western Canada The Peigan elder, Saukamappee gave an account to David Thompson of first seeing a horse circa 1739-40 in an encounter with the Snake. La Vérendrye's son bought 2 horses from Mandan and brought them back to Manitoba in 1741. 1743 Henley House established. First inland trading post of the HBC. Established 200 k.m. up the Albany River. Contrary to most histories, Cumberland House (est. 1774) was not the first. 1757 Clive's victory at Battle of Plassey Settled conflict between French and British. Secured British power over Bengal. 1759 Battle of the Plains of Abraham September 13th. Part of Seven Years' War. Key battle in terms of British taking control of what was to become Canada from the French. 1763 Treaty of Paris Ending Seven Years War. 1767 Captain Kinloch dispatched to Kathmandu to aid Newar king against Gurkha aggression. Failed mission. Left in rainy season, were hampered by malaria, and ran short of supplies. 1770-72 Samuel Hearne follows Coppermine River to its mouth on Arctic Ocean. First European to go overland to Arctic Ocean. 1773 Pine Lake Trading Post Established Established by Joseph and Thomas Frobisher. By mouth of Saskatchewan River, on main canoe route to Hudson's Bay, where the Frobisher's intercepted furs en-route to HBC posts, saving the natives an extended trip, but at the same time, disrupting the HBC business. 1774 Frobisher brothers establish post at Frog Portage (Portage du traite) Strategically positioned on Churchill River at the portage to the Sturgeon-Weir River system, which links the Churchill to the Saskatchewan River. 1774 Samuel Hearne establishes Cumberland House. 10 miles west of the NWC Pine Lake post. Second inland trading post established by Hudson's Bay Company - motivated by pressure from NWC. Previously, HBC was based on coast of Hudson's Bay and James Bay, and natives brought furs to them. Oldest continuously occupied site in Saskatchewan. 1774-75 George Bogle in Tibet First British citizen to cross Himalaya into Tibet. 1775 Hezeta first European to identify existence of the Columbia River. Bruno de Hezeta y Dudagoita, as part of a Spanish reconnaissance of the Pacific NW coast. 1779 Founding of the North West Company A limited term partnership amongst a number of independent traders. Banding together partially motivated by incidentApril 22nd on Saskatchewan River at Eagle Hills, where 2 independent Montreal traders - including John Cole - were killed by Cree, largely as a result of trading practices. See also 1783. Philip Turnor makes 1st map . 1st mapmaker employed by HBC to map inland. 1st map follows trip to Cumberland house and Upper Hudson House in 1778-9. Was at Hudson House when independent raders came down from Eagle Hills to escape Cree after April 22nd incident. 1782 Rennell's Map of Hindoostan first published. Reconstitution of North West Company In 1783, a more permanent and formal partnership was formed. 1783-84 Samuel Turner in Tibet Visited Tashilhunpo / Shigatse. 1786 Mont Blanc first climbed. Highest mountain in Europe. 1788 Nepal invades Tibet Tibetans sued for peace and agreed to pay Gurkhas annual indemnity to withdraw. 1789 Alexander MacKenzie reaches Arctic Ocean Descends what is now MacKenzie River. 1791 Second Nepalese invasion of Tibet Shigatse captured and Tashilhunpo sacked. 1791-95 George Vancouver explores Pacific Northwest Makes first detailed map of inside passage, between Vancouver Island and mainland. Establishes that there is no northwest passage. As part of his expedition, Lt. William Robert Broughton went up the Columbia River as far as the Dalles, near the Gorge. Vancouver's journals and charts published in 1798. 1792 Chinese intervene in Tibet to drive out Gurkhas (Re)-Established Chinese influence in Tibet, which was not weakened until Japanese defeat of Chinese in1895. Robert Gray enters and names Columbia River See earlier 1775 entry for Herzeta. Alexander Mackenzie reaches Pacific Ocean First European to cross North America north of Mexico. Reaches Pacific at mouth of Bella Coola River on July 20th. Learns that he had just missed Vancouver's survey crew (who were there June 2nd). Mackenzie's journals published in 1801. 1794 Jays Treaty (Treaty of London) Effective 1796, UK to vacate forts in US North West. UK to stop harassing US shipping. 1796 Fort Michilimackinac taken over by Americans Now in Michigan. Had been important fort for supplying NWC. One consequence of Jays Treaty. 1798 New Northwest Company (X/Y Company) formed Union of Forsyth, Richardson & Company with Leith, Jamieson & Company. Joined by John Ogilvy andn John Mure of Parker, Gerrard & Oglilvy in 1800. Joined by Sir Alexander MacKenzie in 1802. 1800 Malcolm's mission to Persia To secure treaty against the French. 1801-03 Charles Crawford in Nepal. Surveys and maps Kathmandu Valley, as well as makes small map of Nepal, based on information from native travelers. 1803 Establishment of Fort William As another consequence of Jays treaty (1794), NWC had to abandon Grand Portage, which was in US territory. Established fort near old French fort at Kaministiquia. Named Fort William in 1807. Canada Jurisdiction Act 43, Geo. III, c. 138) Justices of the Peace could be appointed in the "Indian Territories" and rimes committed there could be dealr with by the courts n Upper and Lower Canada. (Lamb, 1957. p. 70). Louisiana Purchase The USA under President Jefferson purchased the western drainage of the Missisippi, including the Missouri river drainage, from Napolionic France, therefore acquiring the heart of the continent. 1804 X/Y Company absorbed by NWC Given quarter interest in NWC. Sir Alexander MacKenzie was excluded from the union. 1805 Lewis and Clark Expedition reach Pacific Ocean The expedition began in 1803, with organizing supplies to be shipped to Fort Dubois, just north of St. Lewis, where the team was assembled and wintered. Prime objective was to determine feasibility of inland water route to the Pacific. In keeping with manifest destiny, also intended to establish tie across, and consolidate, the eastern colonies with newly acquired Louisiana Territories, and the west coast - especially the Columbia River drainage- and in the process, gain advantage over the Canadians in the lucrative fur trade. The publication of George Vancouver’s journals and charts in 1798 and Alexander Mackenzie's journals in 1801 both gave urgency to this mission, as well as paved the way. Arrived back St. Louis Sept 23rd, 1806. Lewis arrived in Washington in December and Clark in January 1807. 1805 Fort McLeod established in New Caledonia Established by Simon Fraser and John Stuart. The oldest continuously occupied settlement west of the Rocky Mountains in Canada. Named after Archibald Norman McLeod, a NWC fur-trader. 1808 Webb, Raper and Hearsey survey source of eastern branch of Ganges. Simon Fraser follows Fraser River to Pacific Left Fort George (at confluence of Fraser and Nechako Rivers, near north hook of the Fraser) in late May, reached mouth of Fraser on July 2nd, and returned to Fort George on August 6th. Accompanied by John Stuart, JM. Quesnel, 12 Canadian voyageurs, and native guides. 1809 Capt. W.P. Grant explores coastline of Makran. To determine feasibility as overland route for invasion of India. Concluded it was. 1809 Metcalf's treaty with Ranjit Singh Extends British influence to Sutlej. Pacific Fur Company established Underwritten from New York by Astor, established fort (Astoria) at the mouth of the Columbia River. Inhabitants reached location by ship, the Tonquin, from NY. The Tonquin then went on a trading mission, but was seized by natives on the west coast of Vancouver Island, at Clayoquot Sound, and all hands were killed. David Thompson follows Columbia River to its mouth. Started exploring the Columbia in 1807, at its source, and continued over a few seasons. On reaching the mouth in 1811, he was first to have travelled its full length. 1811-1812 Thomas Manning in Lhasa First Englishman to visit Lhasa. 1812 Moorcroft & Hearsey in western Tibet 1st Selkirk settlers arrive late in season in Assiniboia. June 29th: Columbia arrives at Fort George. First occasion that trading posts in interior of British Columbia were supplied from England via the west coast. June 29th: Isaac Todd carries furs from Fort George (Astoria) to China, establishing trans-globe circuit of trade-goods from England to Fort George, furs from there to China, then China goods to England. 1814-1816 Anglo-Nepalese War Prompted by repeated forays by Gurkhas into British held territories. Treaty of Segauli (I believe signed on November 28 1815 but not ratified by Nepalese until March, 1816) ceded territories of Kumaon and Garhwal in western Nepal to the British, giving them their first common border with Tibet. 1817 Treaty of Titalia Negotiated by Captain Latter, in Feb. 1817, following Anglo-Nepalese war, guaranteed security of Sikkim by British, returned land to Sikkim that had been annexed by Nepalese, and gave British trading rights in Sikkim, up to Tibetan border. 1819 Ranjit Singh conquers Kashmir & Jammu End of Afghan rule of Kashmir. 1819 Nikolai Muraviev travels from Georgia to Khiva Report on Russian slaves contributed to Russian justification for future annexation of khanates in central Asia. 1819-25 Moorcroft & Trebeck travel to Turkistan Reach Bokhara in 1824 via Ladakh, Kashmir, Punjab, Kabul. 1820 Russians reach Bokhara Beat English by 4 years. Establish trade links. 1821 June 1: Unification of NWC and HBC HBC eventually won the competition, largely due to easier access to the west from Hudson's Bay. 1824 Moorcroft & Trebeck reach Bokhara First Englishman there. 1839 Perovsky's expedition to Khiva Force of 5,00 from Orenburg. Disaster. Defeated by winter, and retreated en route with heavy losses. 1842 British acquire Hong Kong Changes British access to China, which up to this point had been restricted to being through Canton, which had made access to China through Tibet attractive. 1843 Dost Mohammed resumes throne in Afghanistan Following flight in 1839 and exile in India in 1840. 1848-1849 Second Anglo-Sikh War Ref: 1, 2. Ended in the Treaty of Annexation. 1850-1858 Construction of the Hindustan-Tibet road Went from Indian plains, through Simla (the summer capital of British India), Bashahar, to Shipki, on Tibetan border. 1853-56 Crimean War France and Britain defeat Russia. 1858 British Government takes over governing India Lord Canning, then Governor General, becomes first Viceroy. 1858 Bahadur Shah II exiled to Burma Last of the 17 Mogul Emperor. Dies in 1862. 1859 First steamboat operating on the Red River. Provides link for shipping goods delivered by railroad to St. Paul, Min. to Fort Garry (Winnipeg). 1865 First ascent of the Matterhorn By Edmund Whymper. Golden age of climbing in Europe. 1869 Shaw and Hayward in Yarkand and Kashgar Shaw is first from Britain to visit. Opening of Suez Canal Britain buys Egypt's 40% share to secure access, esp. to India. Now 3 weeks, rathe than 3 months to India from Britain. Last year that fur brigade goes to York Factory. 1872 1st Steamer, The Commissioner, on Lake Winnipeg Carried goods between Fort Garry (Winnipeg) and Grand Rapids. 1873 2nd Forsyth Mission To Kashgar to establish trade with Yakob Beg. Resulted in valuable surveying. First steamer to successfully run on the Saskatchewan River, The Northcote. An unnamed steamer had been built and launched in 1873, but was dstroyed in rapids 13 miles from launch site on its first run. The Northcote brought goods to/from Grand Rapids, and went as far as Fort Edmonton. 1883 Graham climbing in East Himalaya Arguably first recreational climber in region from Europe. Began in eastern mountains, then in Garhwal. Burma-Tibet Convention Chinese claimed suzerainty. Completed British control of Burma, which began with the Anglo-Burmese War of 1824–26. 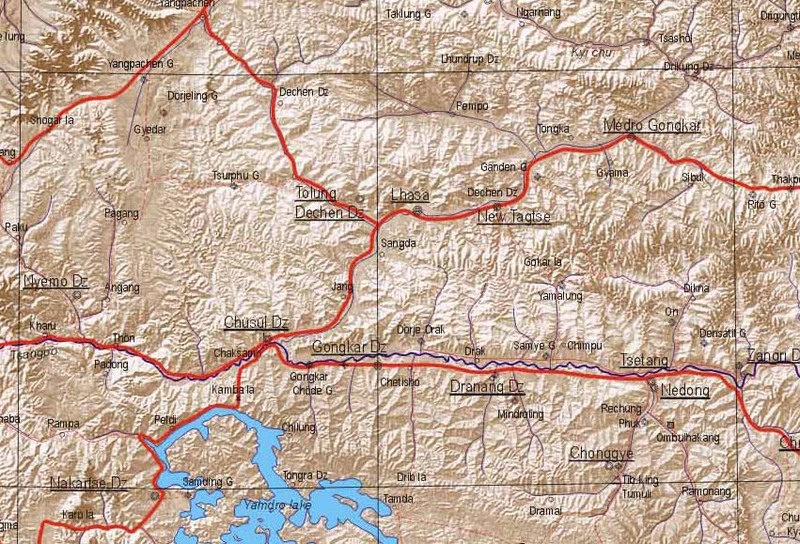 1889 Younghusband and Gromchevsky meet on frontier north of Hunza. 1894-95 Sino-Japanese War Japanese defeat Chinese. This opened door, for the first time since the Chinese intervention in the Gurkha-Tibetan conflict in 1792, for Tibet to attempt to conduct its own foreign policy. 1894-5 Littledales travel in Tibet Travel east from Kashgar, through northern Tibet, then south to within 45 miles of Lhasa, then turned back. 1895 Anglo-Russian Convention Established the Wakham Strip of Afghanistan separating Russian and British territories. 1895 Collie, Hastings, Mumery on Nanga Parbat Mummery, Ragobir & Goman Singh killed. Bruce with expedition part of time. 1898 (?) Kawaguchi in Lhasa Japanese monk. Entered monastery in Lhasa. 1900 Boxer uprising in China Against European acquisition of ports and trade. Put down by joint European forces. 1904-5 Russo-Japanese War Japanese want to stem Russian influence in Pacific. 1905 Lhasa Convention British settlement with Tibet. 1906 Convention Between Great Britain and China Respecting Tibet (Peking Treaty) British and China over Tibet. 1907 Convention Between Great Britain and Russian End of classical "Great Game" in Central Asia. Mason, K. (1955). Abode of Snow: A History of Himalayan Exploration and Mountaineering. New York: Dutton. Meyer, Karl, E. & Brysac, Shareen B. (1999). Tournament of Shadows: The Great Game and the Race for Empire in Central Asia. Washington: Counterpoint.